This was an easy feature to unlock, and it didn't need any rooting, but the downside of this hidden feature was the fact that the percentage text was the same color as the battery progress, thus making the percentage unseen until around 50 percent. It was cool, but I want to see the digits from 99 percent! Thanks to a module from dev Wanam for the Xposed Framework, we can make some cool little tweaks to the Status bar—one being the color of the battery percentage. To get this mod yourself, you must be running Android 4.4 or above, and have a rooted Nexus 7 with the Xposed Framework installed. Download the Wanam Kit (Xposed) from Google Play. This is a variant of another version, but this one is exclusive to Nexus devices, which is great. After installing, open Xposed Installer, got to Modules, check Wanam Kit, then reboot your device. Open the Wanam Kit app and select Status bar. 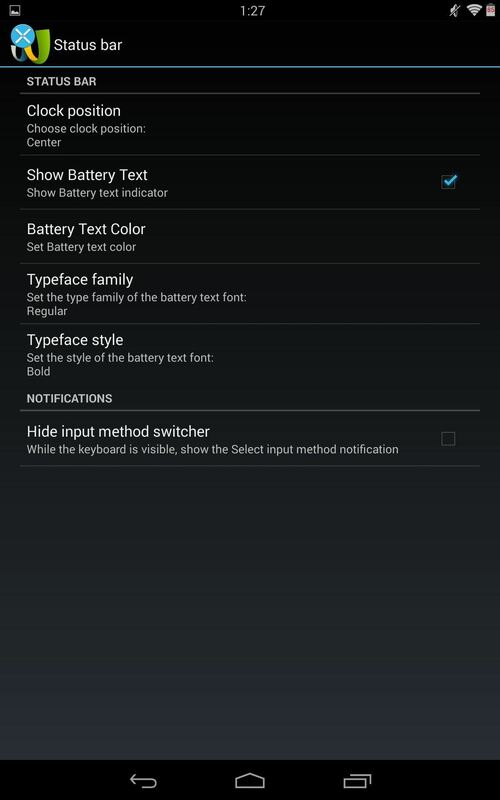 From here, you will be able to enable Show Battery Text, as well as the color. Another quick tweak you can make is reposition the clock or getting rid of it altogether. Make sure to reboot your device after every change you make in order for it to work. 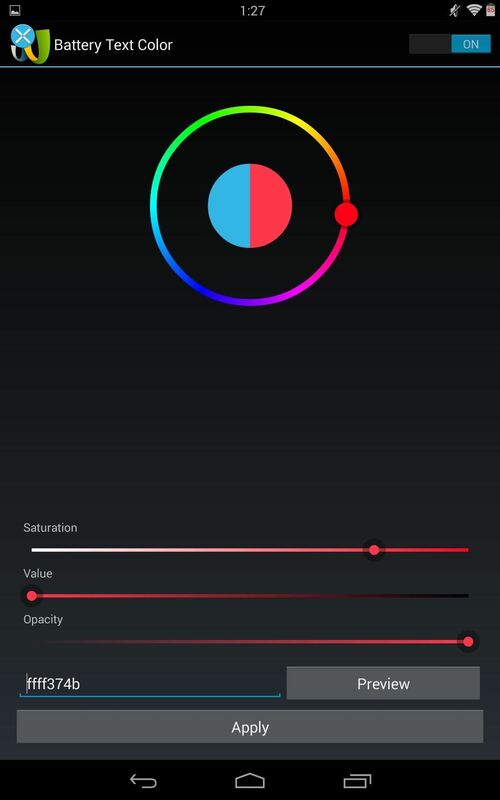 I centered my clock and added a highlighter color to my battery life. As of now, this is all you can do, but look forward to other additions in the future. Comment or message me with any questions. 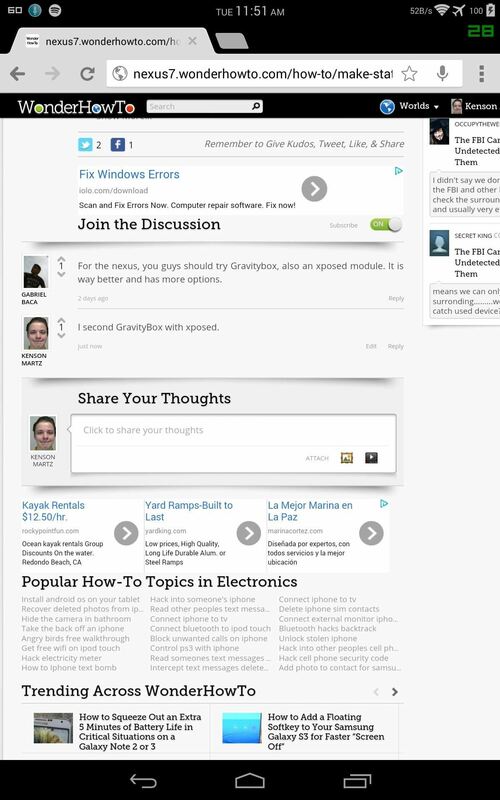 For the nexus, you guys should try Gravitybox, also an xposed module. It is way better and has more options. I second GravityBox with xposed. Gravity is the obvious choice, but we're just giving people options. Those screenshots are nice btw.